“If you are a follower of Christ Jesus . . . all that matters is your faith that makes you love others” (Galatians 5:6 CEV). Have you ever wondered what matters to God? The Bible tells us in Galatians 5:6: “If you are a follower of Christ Jesus . . . all that matters is your faith that makes you love others” (CEV).God says what matters in life is not your accomplishments or your achievements or your fame or your wealth. The other thing that matters is having a faith that causes you to love other people. If you miss that, you have missed the most important thing in life. Over the next couple of days, we’re going to look at the most famous chapter in the Bible on love, 1 Corinthians 13. When speakers want to get your attention and want you to remember something, they use repetition. They say something over and over. In the first few verses of this passage, Paul says the same thing five different ways: The most important thing in life is love. Here are the first four reasons why. 1. If you don’t live a life of love, then nothing you say will matter. “If I could speak all the languages of earth and of angels, but didn’t love others, I would only be a noisy gong or a clanging cymbal” (1 Corinthians 13:1 NLT). We’re really impressed by great speakers. We love eloquence and charisma. But God says, “I don’t care how good of a communicator you are. Are you living a life of love?” If you’re not, then nothing you say will matter. Words without love are just noise. 2. If you don't live a life of love, nothing you know will matter. “I may have the gift of prophecy. I may understand all the secret things of God and have all knowledge . . . But even with all these things, if I do not have love, then I am nothing” (1 Corinthians 13:2 NCV). We live in a world where knowledge is exploding. We are smarter than we’ve ever been. But we still have the same problems: crime, abuse, prejudice, violence. Why? Because the world doesn’t need more knowledge. It needs more love. You may be a genius. But God says if you don’t have love in your life, all that you know is worthless. 3. If you don’t live a life of love, nothing you believe will matter. The Bible says, “Even if I had the gift of faith so that I could speak to a mountain and make it move, I would still be worth nothing at all without love” (1 Corinthians 13:2b TLB). There’s a myth that being a follower of Christ is just a matter of believing certain truths. Nothing can be further from the truth! Following Christ is about living a life of love. It takes more than belief to please God. 4. If you don’t live a life of love, nothing you give will matter. The next verse says, “If I gave everything I have to the poor and even sacrificed my body, I could boast about it; but if I didn’t love others, I would have gained nothing” (1 Corinthians 13:3 NLT). Love isn’t always the motivation for giving. Some people give just to get back or out of guilt or for control or prestige. You can give for a lot of wrong motives, but the Bible says if you’re not doing it out of love, none of your giving counts. The Bible is very clear about what happens when you don’t live a life of love. Tomorrow we’ll look at the last reason why you need to focus on your faith that makes you love others. If a friend described you, what would they say about how you show your love to others? The Bible says, “The only thing that counts is faith expressing itself through love” (Galatians 5:6 NIV). What do you think that means? Pastor Rick wants to show you what it really means to love others like Jesus with his six-session study kit, 40 Days of Love. 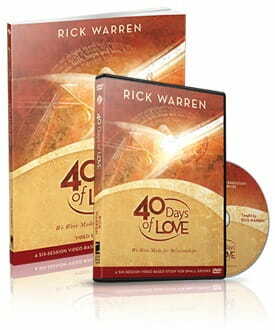 With a teaching DVD and study guide workbook, 40 Days of Love is a powerful resource for personal study or small groups. 40 Days of Love is our thank-you for your gift to share the hope of Christ through Daily Hope. Please request your copy when you give below. Thank you for your support – and may 40 Days of Love guide you closer to Jesus, as you learn to love like Him!